Is there anything more daunting than the first hive inspections of spring? This was the harshest winter since I started keeping bees. Yet, I am happy to report that I only lost one hive. It was the VSH Hive that was full of drones at the end of fall – of course it was expected. What was not expected was how much honey is in my hives. The VSH hive still had several frames of honey but was being robbed by the other bees, so I took the 20 frames of wax and honey and divided them between the surviving hives. On hives A, B, C.1, and B.1: I added a super with five frames of wax/honey and five unwaxed plastic frames. I didn’t want to give them too much comb to defend against wax moths and beetles. Hive-C and Hive-B.1.1 were both very healthy but still had some empty frames. So I replaced the empty frames with waxed ones. At home, I moved the fence surrounding my bee yard and, in doing so, doubled the area to about 30’x60′. I plan to move my chickens into this area as soon as it dries up a little – as well as some bees. The plan is to make a lot of splits this year. The question is, when to start? The weather looks warm and favorable but there is still the Easter cold snap to consider. Nonetheless, as soon as I see drones, I will begin the splits. I also plan to do hive removals this year to help increase my apiary size. 100 Hives by winter. It’s a lofty goal but that’s how many I need. The remaining 7-hives will most likely split into 28-hives. The rest will have to come from the bee removals. I, of course, realize the flaw of my goal – but “a man’s reach should exceed his grasp, or what is heaven for?” -Robert Browning. 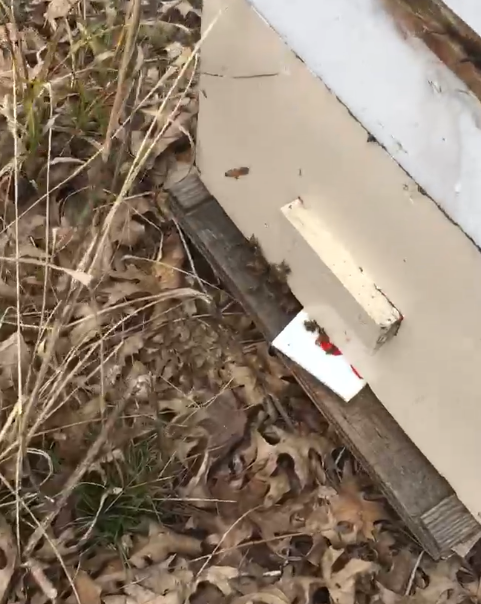 Given how much honey is in my hives after this long harsh winter, I am confident, that I only need one super per hive to survive next winter. I actually feel excited by the thought.